In my February 21 post, I mentioned that a lot of the rocks and some of the trees in Tasmania are more reflective of the geology and flora of Antarctica than of mainland Australia. (Antarctica before it froze, that is—there is a substantial amount of frozen flora beneath the ice, all dating back to the time before that hunk of terrain drifted so far south.) Nowhere is this more true than in the island’s cool temperate rain forest. 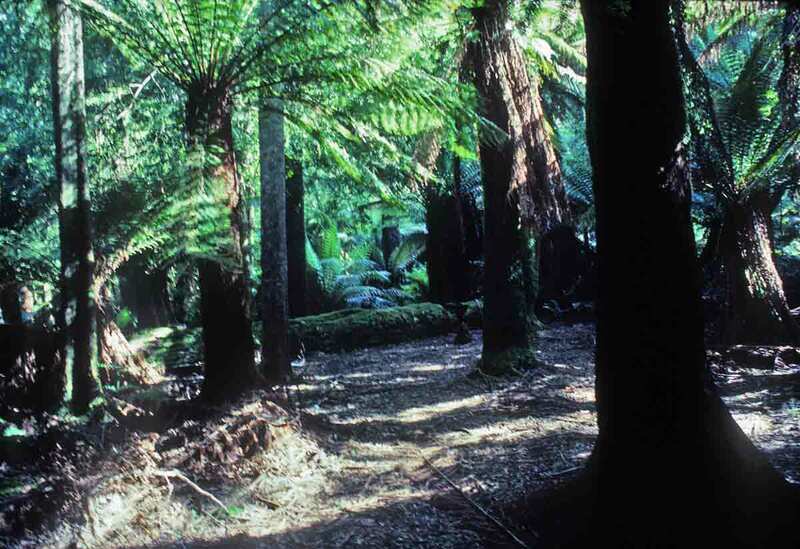 In fact, Tasmania’s rain forests are at least partially defined by the absence of the dominant trees of the mainland— eucalyptus. These temperate rain forests have something of a parallel in the old-growth rain forests of America’s Pacific Northwest: ancient trees, lots of mosses and lichens, cathedral-like effect of soaring trees. I have enjoyed both locations, and while they are not identical, they have a similar feeling of antiquity and seclusion. It was our last day in Tasmania, and we started the day in the cool, quiet, shadow-dappled splendor of one of these forests. We were surrounded by tall ferns and fragrant trees. The trees in Tasmania’s rain forest include Tasmanian myrtle, leatherwood (from the flowers of which one of Tasmania’s most splendid honeys is gathered), celery-top pine, sassafras, Huon pine, pencil pine, and deciduous beech. Most of these trees are incredibly slow growing, and areas that are burned are unlikely to recover in several human lifetimes. Continuing our northward journey, we came to Binalong Bay. Binalong Bay Beach, which borders the vivid blue water of the bay, is said to be one of the loveliest beaches in Tasmania—and it certainly seemed so to me. This is a popular holiday area, with nearby clusters of holiday cabins. However, most of the area around the bay is either conservation area or national park, so there are few buildings and beaches are wide open. As the coast sweeps northward, Binalong Bay transitions into the Bay of Fires and then takes a sharp turn out to Eddystone Point. The scenery becomes more dramatic and even more beautiful. At Binalong and Bay of Fires, the beach alternates between granite boulders and soft white sand. We sampled a bit of both, and enjoyed the cool water and the area’s beauty, before heading off to the evening’s camp site. While a local camera repair shop tries to figure out if they can make my scanner work again, I’ve got a temporary fix in place. A photographer friend (the one you can visit if you click on In Beauty I Walk in the blog roll at right) is going to let me use her scanner to do at least a couple of weeks worth of scans, to keep me going until I learn the fate of my scanner. So I should be back in business tomorrow—at least for a while. 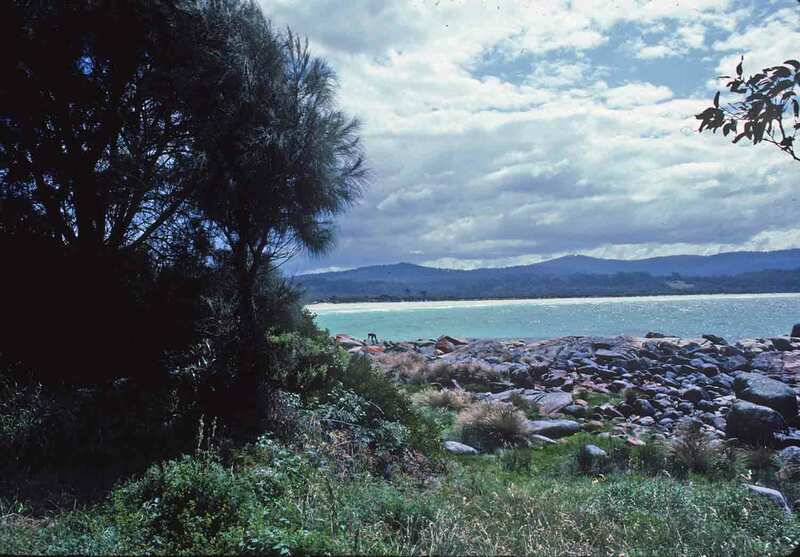 Well, I had pulled a lovely selection of slides to scan, so I could continue to share with you images of Tasmania and beyond, but my slide scanner (Nikon LS-2000 Super CoolScan) just failed me. It scanned one slide all black, and now it doesn’t even register that there’s a slide in the scanner. So until I can get it fixed, or can make arrangements with photographer friends to use their scanners, I won’t have much to post. Sure, I could just write stuff, but I figure that here, you want images too. Sigh. Don’t know if I’ll get anything accomplished before the Mother’s Day weekend (have to go spend some time with mom), but then I’ll tackle this problem and start sharing the beauty of Australia with you again. Till then, there are more than 200 posts here stretching back over a few years, so you can still get fairly immersed in Australiana, if you so wish. And wish me luck with the scanner.